Super Bowl? Mardi Gras? 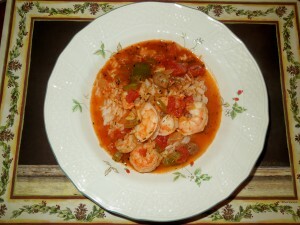 Shrimp Creole, Recipe, Hot, Spicy, Full of Flavor; Waking Up the Taste Buds!! Gluten Free!!! Creole cooking is indigenous to New Orleans. A mixture of French, Spanish, Italian, American Indian and African. 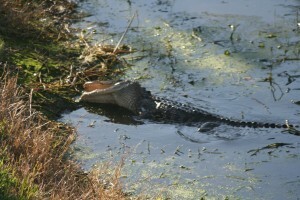 Cajun cooking is also Louisiana born, but with French roots. Someone asked me not that long ago…what dish can you make without even thinking about it? 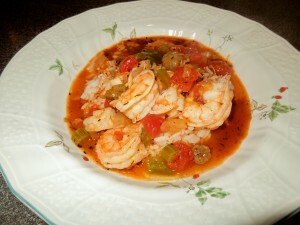 Shrimp Creole, no two bones about it, I love it. Based on the recipe by renowned Chef Paul Prudhomme. He has said in the past that he likes to share his recipes. I first tried the recipe in 1984. It is a recipe that is requested by my kids again and again. I made his Shrimp Creole my own by changing a few things. Don’t get me wrong, the essence of the recipe is there. But, I just give it my own twist. I think what makes this Shrimp Creole is the stock. 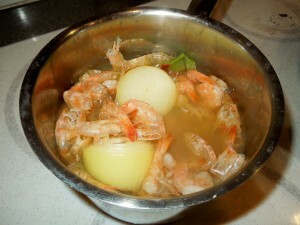 It is made with the shrimp shells, onion, celery, bay leaves, and a whole shrimp, here or there. It really has so much flavor. The sauce can even be made a day ahead. 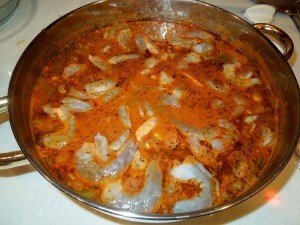 Next day, heat it to almost boiling point and then add the shrimp, turn on low, let them cook for about 8 to 10 minutes. It is great for a party. Know your guests, make sure they do like seafood, adjust the heat. 2 lbs. (1 lb. large shrimp and 1 lb. medium shrimp). Try to get the easy peel. Visually, I like to see the 2 sizes of shrimp on my plate…your choice. A little bit of fat: 1 or 2 slices of bacon, chopped, 2 sausage links (maple or regular), also chopped, or 2 tablespoons of olive oil….your choice, just select one. 1 1/2 cups, finely chopped onion. Stock: In a saucepan put 2 1/2 cups of chicken broth. I used low sodium. Then add the shrimp shells and one whole shrimp. 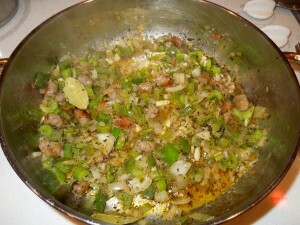 Add a small onion (cut in half), a celery top, a bay leaf, a garlic clove. Bring to a boil, cover, and then lower to simmer for about 15 minutes. You just want a rich broth. It makes all the difference in the world and it is done in no time. In a large saucepan cook your choice of fat on medium high heat, for a few minutes. Add half of the onions and cook for about 3 minutes, stirring. Make sure they don’t burn. 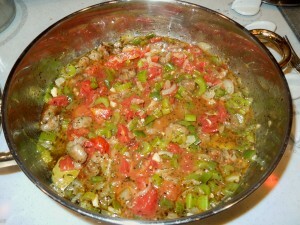 Add remaining onions, celery, bell pepper, and butter. Cook for about 5 minutes until tender. Stir a bit. Add the garlic, bay leaf, salt and peppers; stir well. Add the Tabasco, thyme, basil, and 1/2 cup of the stock. Cook over medium heat for about 5 minutes. Add stewed tomatoes, cook for a couple more minutes. Stir and scrape the bottom of the saucepan. 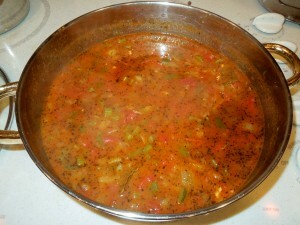 Stir in the tomato sauce, and simmer for about 5 minutes, stirring occasionally. Add the remaining 2 cups of stock and sugar. Continue cooking for about 10 minutes. Taste and adjust accordingly (more salt, more heat, more sugar). Increase the temperature to medium high, add the shrimp, cook for a couple of minutes. Turn it off and let them sit cooking for another 8 minutes until they are plump and pink. Prepare rice by following the directions of your favorite rice. This can be done ahead of time. Just keep it warm. I like to serve this dish in a shallow bowl. Rice and then the Shrimp Creole over it. Make sure you pour plenty of broth and veggies. Add a salad to complete the dinner. Delicious!! Note: This recipe is gluten free. Check the chicken broth, the tomato sauce, the stewed tomatoes. Plenty of brands that are gluten free, including the store brands of grocery stores. Making it your own is the best part. This recipe is never the same in my household. At times, I like to add cilantro, which I like. Other times I make extra stock because I really do like it. 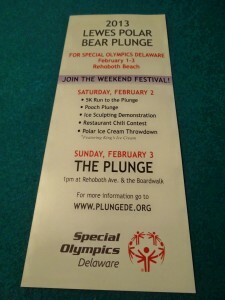 Enjoy while cheering the Ravens on!! Comments Off on Super Bowl? Mardi Gras? 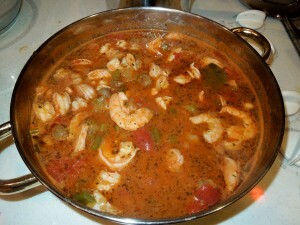 Shrimp Creole, Recipe, Hot, Spicy, Full of Flavor; Waking Up the Taste Buds!! Gluten Free!!! 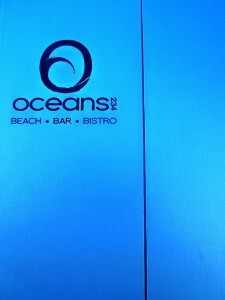 Oceans 234, Deerfield Beach, Florida, Battle of The Fans, Super Bowl XLV! !, February 3rd, 3:00 p.m. Free Pig Roast Buffet During 1st Quarter, South Florida!! This is a battle that I am counting on the Ravens to win! This is their year; many say, that it is their destiny. 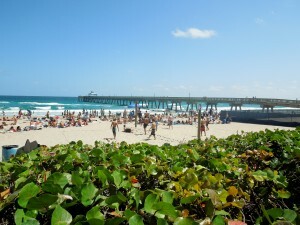 And, are you enjoying the sunny weather in SoFlo? Hope so. Oceans 234 is hosting The Battle of The Fans. RSVP at 954-428-2539,. It will be on Super Bowl Sunday, February 3rd at 3 p.m. Reserve your table on your teams side. Two big screen tv’s, a free pig roast buffet for the first quarter!! Oceans 234 has the perfect location, right on the beach. 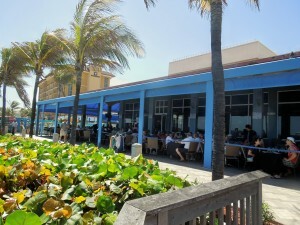 Enjoy seating outside on their cafe terrace, “boardwalk” style, or choose inside. Plenty of drinks and plenty of food. 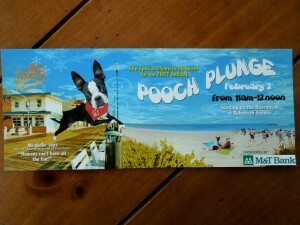 Please visit their website at http://www.oceans234.com to check what else they have to offer. The menu is varied; something for everyone on your party. And my “gotta have it” lunch? 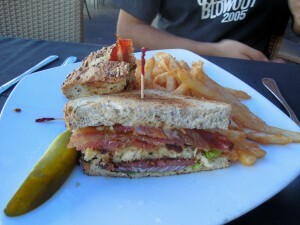 The Crab Cake BLT. It is awesome!! 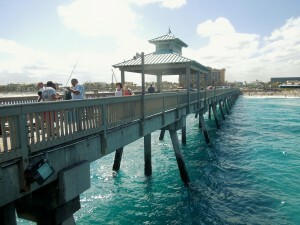 Comments Off on Oceans 234, Deerfield Beach, Florida, Battle of The Fans, Super Bowl XLV! !, February 3rd, 3:00 p.m. Free Pig Roast Buffet During 1st Quarter, South Florida!! Crispy Pork Belly, St. Louis Ribs, Barbecue Sauces, Delmarva Chicken, Creamed Corn, Mashed Potatoes, Sussex Medley…Gluten Free!! 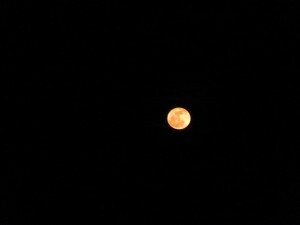 At Bethany Blues, Lewes, Delaware…Live Music, Fridays, Saturdays, Sydney’s Music Revival at 8:30 p.m.
A Delmarvalous full moon, no less!! It was gorgeous. 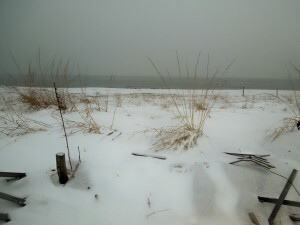 I stood on Lewes Beach, Delaware, to admire it. 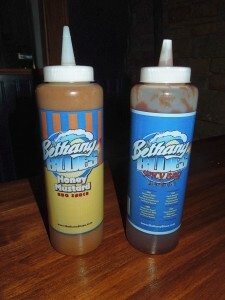 Then, off to Bethany Blues, Lewes, located at 18385 Coastal Highway. 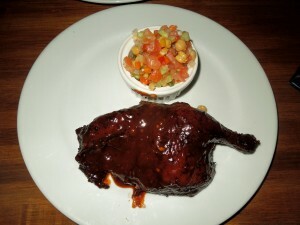 A craving for ribs and barbecue chicken. Tel. 302-644-2500. Website? http://www.bethanyblues.com. Love coming here when I least expect it. I give Bethany Blues and Big Fish Grill big thanks for being so aware of customers with food allergies and sensitivities. In my family’s case, it is a gluten allergy. Bethany Blues Manager will come to your table to discuss your allergy and your food options. 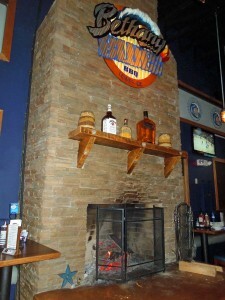 The restaurant was comfortably crowded and the fire was glowing. We sat at the bar area. 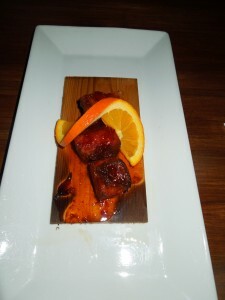 A dish that I would say “gotta have it” is the Crispy Pork Belly. It is an appetizer. Basically, you get cured pork bellies with a vinegar/apple cider sauce. Just a little bit is enough. Delicious. 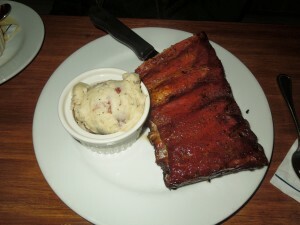 An order of St. Louis Ribs which were thick and meaty, prepared with a brown sugar rub, smoked for a long time. The mashed potatoes were made out of red skin potatoes. 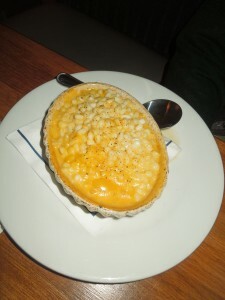 The Cheesy Creamed Corn….customers’ favorite. My Saucy Delmarva Chicken was smoked and seasoned and then brushed with their house sauce. The meat fell off the bones, true!! And, that Sussex Medley, was a mix of garbanzo beans, diced cucumbers, tomatoes, onions with chopped cilantro in a light vinaigrette. It screamed Summer! That side was sooo good. During the summer months, when the veggies are at their best, this Sussex Medley is made with local tomatoes and cucumbers. Some of their award winning sauces are gluten free. The background music was good tonight. Live music on Fridays and Saturdays with Sydney’s Music Revival starting at 8:30 p.m.
Friday, 2/1 is Deb Callahan Band – Philadelphia’s blues and soul drenched vocalist and songwriter. Check http://www.debcallahanband.com. Saturday, 2/2 Keith Mack and Ed Shockley, lifetime musicians will be performing. They are returning to their fan base by popular demand. Check http://www.keithmack.net. 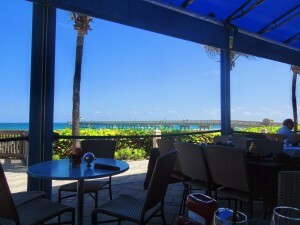 Checking the restaurants that are open year-round….2013 is a new season!! Comments Off on Crispy Pork Belly, St. Louis Ribs, Barbecue Sauces, Delmarva Chicken, Creamed Corn, Mashed Potatoes, Sussex Medley…Gluten Free!! 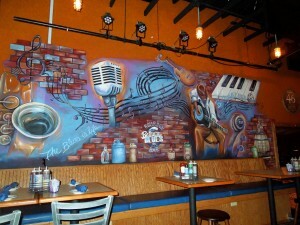 At Bethany Blues, Lewes, Delaware…Live Music, Fridays, Saturdays, Sydney’s Music Revival at 8:30 p.m.
What’s Cooking? Cider Beef with Smashed Cheese Potatoes, Recipes, Begged, Borrow & Stolen, Gluten Free!!! 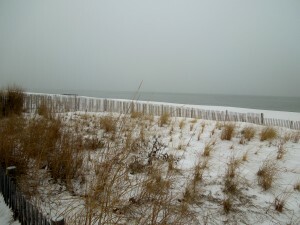 It’s 30 degrees at the Delaware Beaches. That calls for a homemade soup; comfort food. A few yeas ago I was watching Rachael Ray on t.v. and she mentioned a recipe that her mother used to make all the time. Well known cooks do like those meals they grew up with. A well known chef from the Delaware Beaches told me that he still makes those green bean casseroles, etc. etc. during the holidays. They are recipes that are simple, nutritious and well seasoned…most of all, they bring good memories. Most of the time I pick up a recipe, look at it, make it the way it says it should be done, then, a little bit of this and a little bit of that and it will be changed by adding or deleting ingredients…making it my own. This recipe was not gluten free, but I have made it so by using ingredients that are gluten free. For example, gluten free flour, cider, and broth. I never buy shredded cheese. A lot of times they put a preservative that has gluten, therefore, I grate my own. Salt is optional…black pepper? Always. 1 chopped large yellow onion; the ones that make you cry. 3 cups of good quality, dark and cloudy apple cider…check the ingredients if you are making this recipe gluten free. Place an oven proof pot (make sure you have a lid) over medium high heat on the stove top. Add the olive oil and butter. Season the beef with salt and pepper and add to the pot once the butter and oil have melted. Brown on all sides. It will take about 5 minutes or so. Add the onions, carrots, turnips, and cook for about 5 minutes. Sprinkle the flour and stir to combine and coat, about 1 minute. Stir in the apple cider and the beef stock, or broth. Transfer to the oven and braise it for about 45 minutes. While braising, fix the “smashed” potatoes, by boiling potatoes in a large pot, about 15 minutes. Drain and return them to the pot. Add milk, sour cream, and cheese. I used a mixer to mash them because it gives them a smoother consistency. 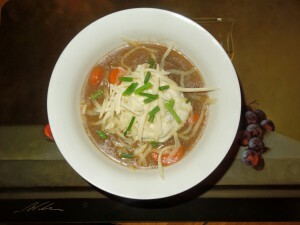 Serve the soup, top it with the mashed potatoes…garnish with the chives and extra grated cheese. You want more potatoes than soup? You decide. Enjoy!! Add a salad and you have a complete meal. That was easy. Note: You can cut the ingredients in half to make it for just a few of you. Snowflake? 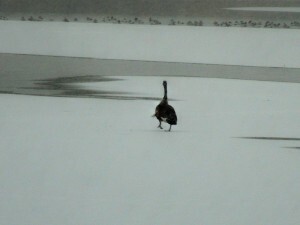 Snowbird? Warmer in the South? I hope so!! I opened my email this a.m. and the first thing I saw was an email with attachments from my snowflake neighbor. She has gone for a month to Florida. She is only a snowflake since she does not go for the whole season. That’s what snowbirds do. I was not sure if I was going to post this on my website. At times, I only do so on my AboutMyBeaches Facebook page. Just tidbits here or there. 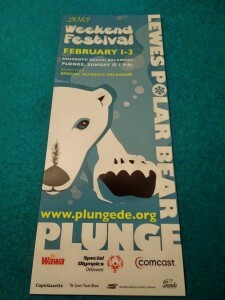 But, after our snow event….I think the pictures came just in time. She is on the west coast. That was very nice…but, it gets better with the next ones. Looks like it is warm!! Enjoy!! Comments Off on Snowflake? Snowbird? Warmer in the South? I hope so!! The scene is so completely different from the summer months. 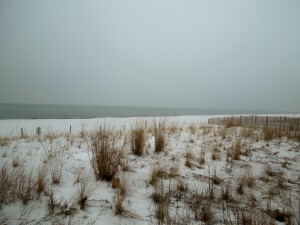 Don’t get me wrong, there is still plenty to do in Rehoboth Beach. January and February are the quietest months. 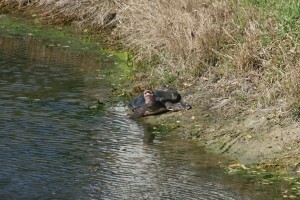 Locals love it at this time of the year. A well deserved rest for many. I enjoy checking downtown Rehoboth Beach at the end of the day. It has been really pretty this past week. We have gone from balmy to frigid temperatures in a matter of days. 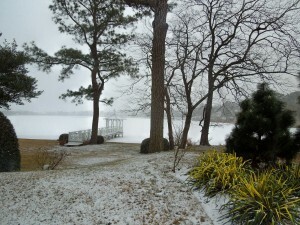 Snowing as I write this post. 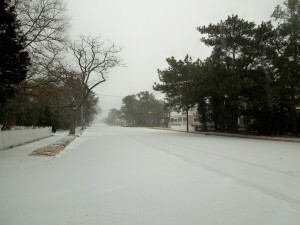 Took off to check how Rehoboth looked as snow started to pick up. 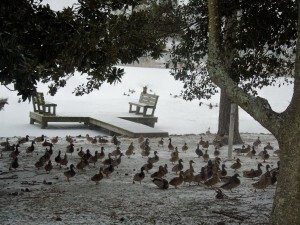 For a moment I wondered where everyone had gone. 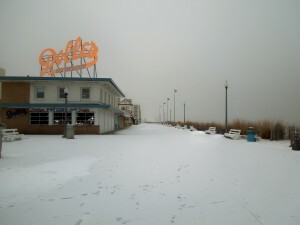 Looking north on the Boardwalk. And, then south. 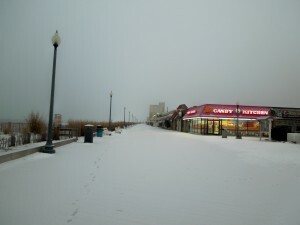 Hard to see the Boardwalk so empty, right? 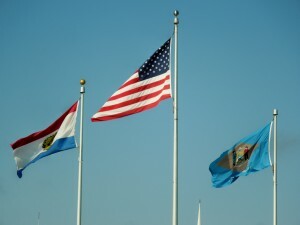 There are 3 lakes in the Rehoboth Beach and Dewey Beach area. 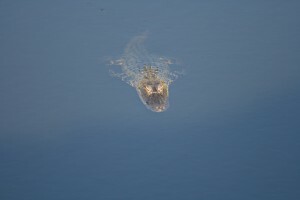 These fresh water lakes are the closest to the ocean anywhere in the country. 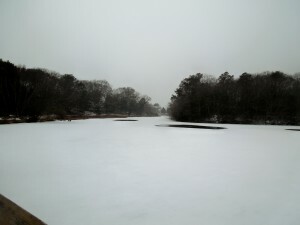 Lake Comegys is in Dewey Beach. 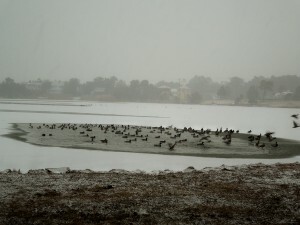 Lake Gerar looked like this today; it is only about a block and a half from the ocean. It was so quiet. I love stopping at Silver Lake. 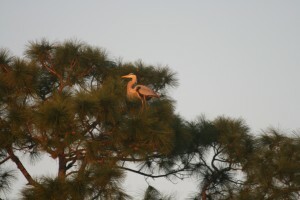 You never know how many birds you are going to find. 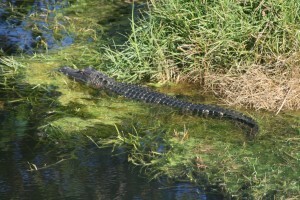 The scenery changes from day to day, depending at what time of the day you visit. 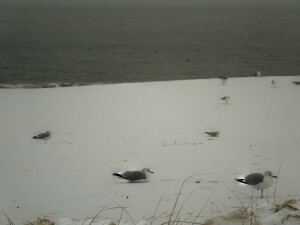 On the northside of the Boardwalk the seagulls were staying put, and the snow was sticking. The beach always looks beautiful from any angle. 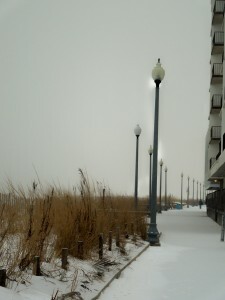 These photos were taken from the Boardwalk where Rehoboth Avenue meets the Atlantic Ocean. 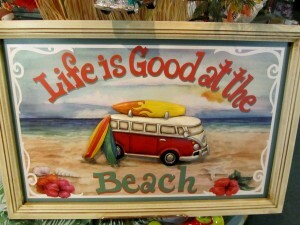 For the ones that come to Rehoboth Beach only in the summer…it’s about time you visit during the Second Season!! A little R & R is good for everyone!! Talk to you later. 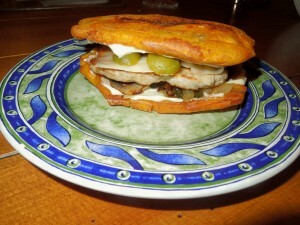 Plantainwich?, Tostonwich?, Testing Testing…It will be Gluten Free! In Latin countries they use plantains all the time. Green or ripe? The recipes are different. It is comfort food. I bought a few green plantains a couple of days ago and I decided to just try to make a sandwich. The ingredients I wanted to incorporate were like the ones used in a Cuban sandwich. I don’t have the recipe written yet. I am still debating what else to add to it. These are the pictures. 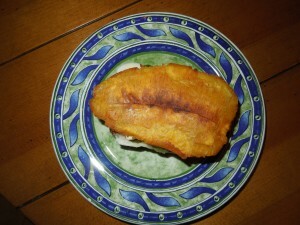 It was made with fried green plantains, smashed and then refried. A little mayo, thin pork, fried onions, mushrooms and jalapenos, sweet pickles, and thinly sliced cheese. I keep thinking that a slice of ham might add an extra flavor. As soon as I have it in a recipe form….I will be back. Comments Off on Plantainwich?, Tostonwich?, Testing Testing…It will be Gluten Free!